On September 24, 2012, Freedom House released the 2012 edition of the Freedom on the Net report. It includes detailed country reports and a numerical index, assessing the degree of internet and digital media freedom around the world. The World Summit on the Information Society Forum 2012 is taking place in Geneva, Switzerland from May 14 to 18 2012. 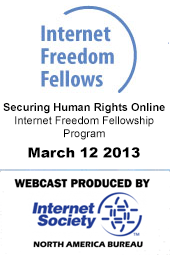 At the event, stakeholders from throughout the world discuss strategies for promoting human rights on the Internet. Freedom of expression is a core value of the Geneva Plan of Action, a long-term vision to emerge from the United Nations’ World Summit on the Information Society (WSIS) held in Tunis in 2005. The discussion at WSIS Forum 2012 will revolve around the human rights implications of information and communication technologies, and inform the WSIS review process leading up to 2015. The WSIS Forum 2012 is jointly organized by the United Nations Educational, Scientific and Cultural Organization (UNESCO), the International Telecommunication Union (ITU), the United Nations Conference on Trade and Development (UNCTAD) and the United Nations Development Program (UNDP). Tactical Tech created a video to encourage people to join the Tor Network.